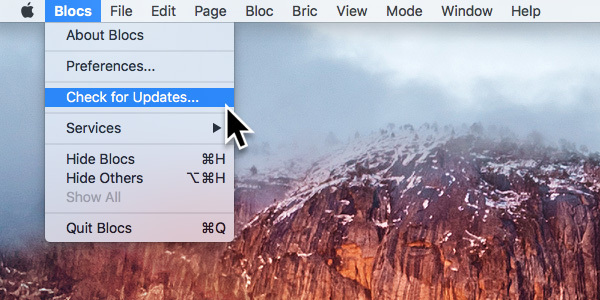 Blocs has a built in update mechanism that will notify you when an update is available. This notification is usually shown a few moments after starting up the app. If for some reason, you don’t get the notification and you know there is a new version of Blocs available, leave the app on the start screen for around five minutes. After this period if the notification does not show, you can proceed to manually check for available updates. It is important to remember you cannot upgrade Blocs via the built in update mechanism. For example, if you want to upgrade from Blocs v2 to v3, you will need to use this alternative method. To manually check for updates, simply navigate to Blocs > Check for Updates from the main menu. This will force Blocs to check for available updates. If the Check for Updates option is greyed out, it means you have automatic updates switched on. You can switch this off in the main Blocs preferences, which you can access via the main menu Blocs > Preferences. When updating Blocs, if the download fails due to a connection error or some other unforeseen issue, you can alternatively download the latest version of Blocs here. If you are looking for an archived version of Blocs 2, you can find those here. If the problem is not resolved following these steps, please refer to our bug reporting help page to alert this issue to our technical support team as a potential bug.